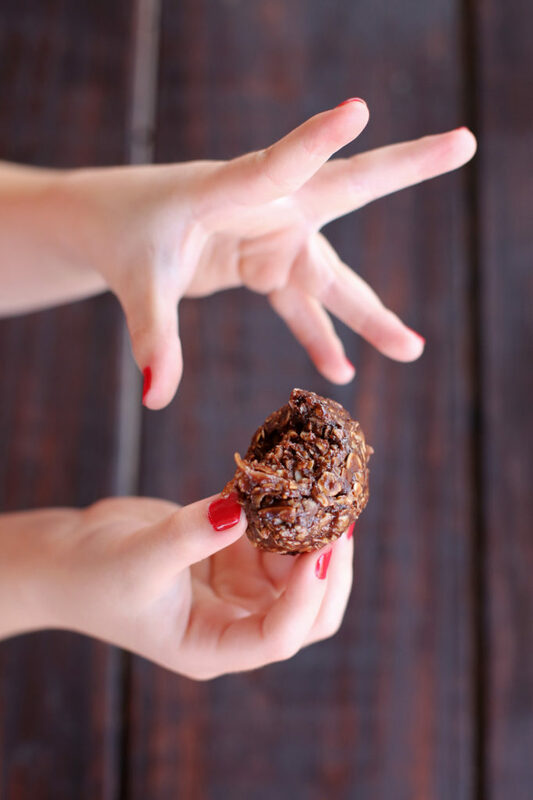 These no-bake chocolate peanut butter energy balls are the perfect after-school snack or treat to pack in a lunchbox. 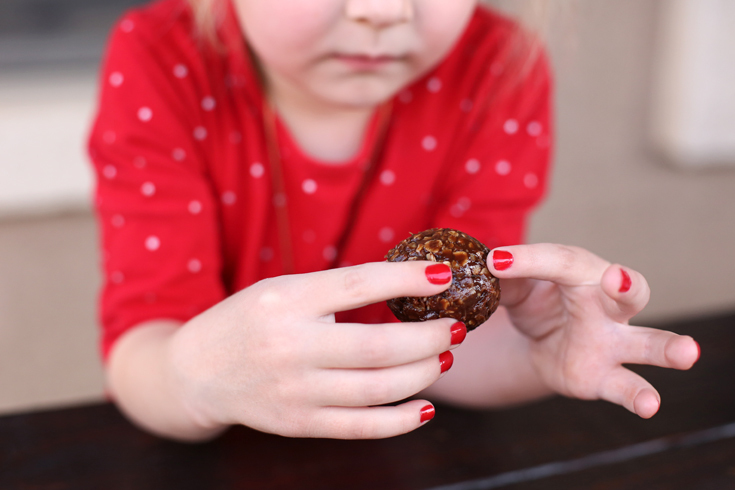 Make a big batch of these energy bites and store them in the freezer for a quick and delicious snack – your kids (and you!) 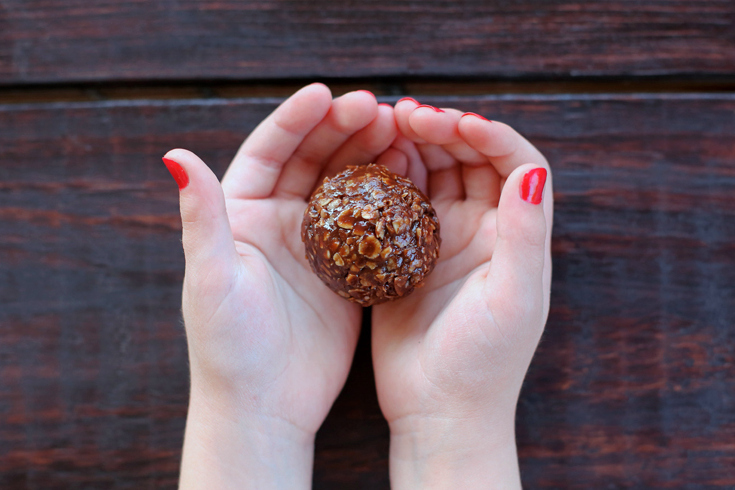 will gobble up these tasty little granola balls! When I was growing up, my mom did a lot of cooking from The Jane Brody Good Food book. Last time I was visiting, she had her copy opened up on the counter, and I noticed little notes written in the margins of various recipes. Theres were little splashes on some pages and a light dusting of flour on others. I mentioned to her that I remembered that cookbook all throughout my childhood and she said it was one of the cookbooks where practically everything she’d ever made was a success. I don’t own a Jane Brody cookbook, but Mel’s Kitchen Cafe is that way for me. 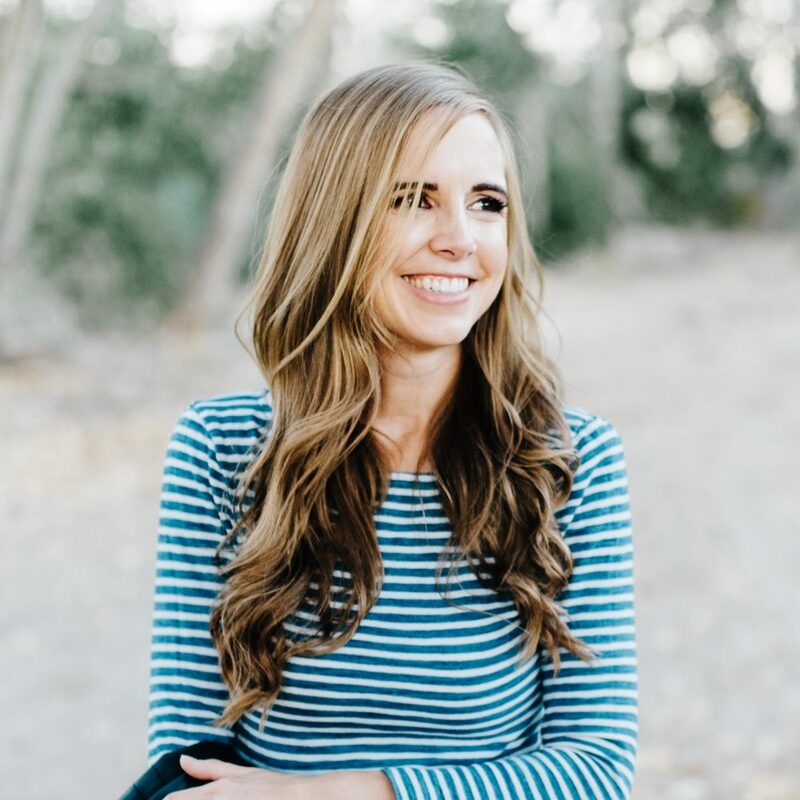 I first discovered her blog just before we moved away from Texas the first time in 2009. I’d just met Allison, who would go on to become one of my favorite people on earth when we moved back and were neighbors for three years, and she made a couple of recipes from there for different occasions and every one was mind-bogglingly good. After we moved to Boston, I started cooking my way through recipe after recipe on her blog, and one after another was a huge hit. I know whatever I make will be delicious, and if I need a specific recipe, I always go to her blog first. At this point, nine years later, if Bart raises an eyebrow when I tell him what’s for dinner, I can just say, “It’s from Mel’s Kitchen Cafe” and he’s immediately assured he’ll like whatever it is. 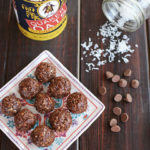 Of course, this recipe for energy bites wasn’t much of a stretch, because there is no one in my family who doesn’t like chocolate and coconut and almonds. 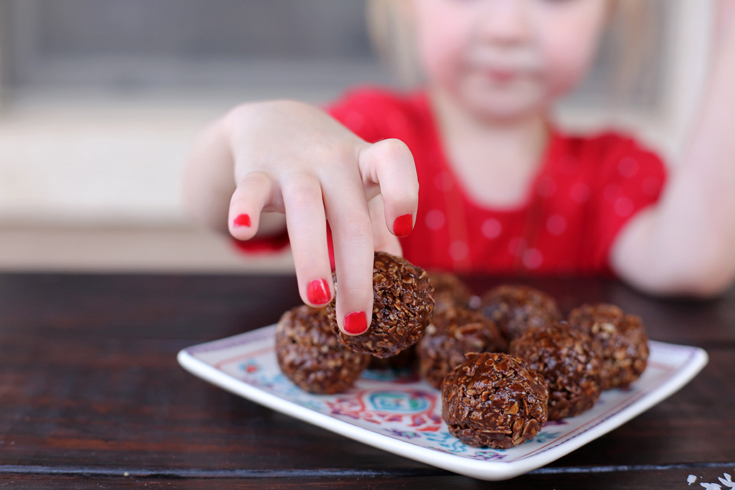 And, as I expected, these little no bake granola balls were delicious. 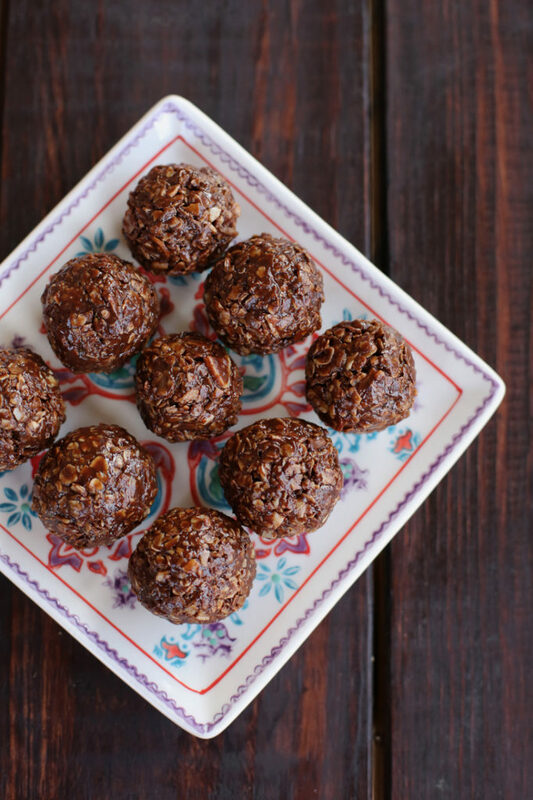 I made a few changes based on what I had on hand, and next time, I’m making a triple batch of these little energy balls because they were the perfect snack to keep stocked in the freezer. Line a baking sheet with parchment paper or a silicone liner and sprinkle the coconut and almonds. Bake in the oven for 5-8 minutes, stirring every few minutes, until the coconut and almonds are golden-brown and fragrant. In a small saucepan, melt the honey, butter, peanut butter, cocoa powder and chocolate chips together over medium heat, stirring frequently to keep from burning. Remove from heat, stir in vanilla, and pour over the oat mixture. Stir until everything is thoroughly coated. With a cookie scoop, scoop mounds onto the cookie sheet you used to toast the coconut and almonds (leave the parchment paper or liner on there). Let them cool about 10 minutes, then use your hands to roll them into balls. 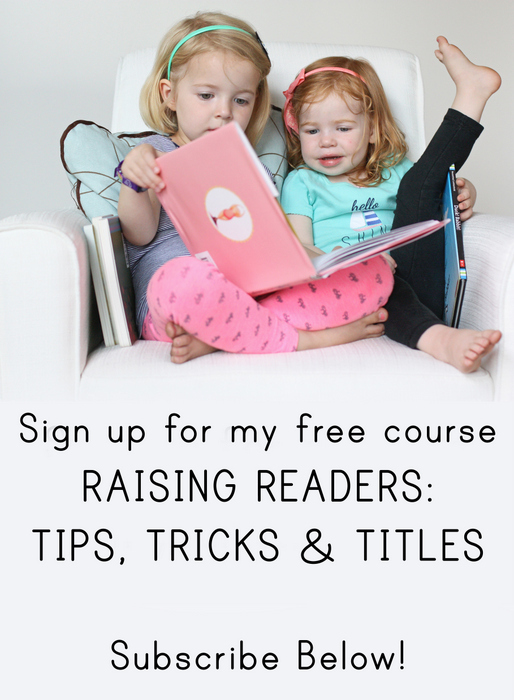 The Pioneer Woman is totally that person for us in our house! 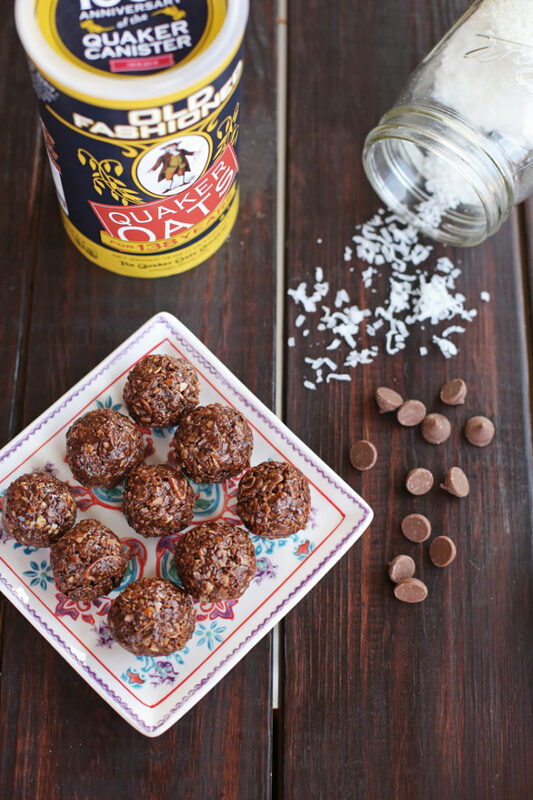 When I saw these balls I thought, "If I have all the ingredients in my house, I'm making these right now! "… But alas, no honey… and I'm assuming that's a crucial ingredient. Tomorrow! Mel's thick and chewy cookie bars are one of my go-to recipes whenever I want something quick and delicious to bring somewhere. I highly recommend mixing equal amounts of semisweet & white chocolate chips to achieve cookie bar perfection. I feel exactly the same about Mel's kitchen cafe. She is my go to. I also go to Pioneer Woman. I love these so, so much! They are currently in my freezer. I'm laughing at myself, because when I took a picture of mine they looked like, well, deer poop! I wonder if I could substitute the peanut butter for something else? I’m not a big coconut fan….anything I can sub or do you think I can leave it out? I haven’t tried it, but if you do let me know how it works! Every night my husband says, “is this Mel’s?” And 90% of the time, it is. I feel like I totally could have written this post–we swear by Mel’s over here too, and my husband almost always asks if a new recipe is from her site when he tries it, ha ha 🙂 These look scrumptious!